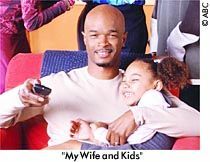 For "My Wife and Kids"
*There are an estimated 102.2 million television households in the USA. A single ratings point represents 1%, or 1,022,000 households. Share is the percentage of television sets in use tuned to a specific program. Ratings for the pliot episode were very high with an 13.7 average for the back to back episodes which were aired. Commercials were shown during the 73rd Oscars which also aired on ABC a few days earlier. The Oscars had 800,000,000 viewers and so with all of the hype that the premiere was given alot of people tuned in. There were 10.4/17 million viewers for the pilot episode. The second episode aired the same night as the first as a back to back hour long premiere for "My Wife and Kids". This episode had 11.7/18 million viewers. Since the first two episodes did so well ABC wanted to give the show a little more hype by putting it's stars on daily talk shows...so on April 3, 2001, Tisha Campbell appeared on Rosie O'Donnell with a clip of this week's show, and the following day April 4th, 2001 Tisha appeared on "Live with Regis and Kelly" with yet another new clip while Damon Wayans appeared on "The View". "Grassy Knoll" was the 3rd episode and was also part of a back to back hour long segment with another "My Wife and Kids" episode. This episode had 9.0/14 million viewers. The fourth episode had 9.0/14 million viewers as well as the previous episode. The show continues to be doing pretty well. Well as D-Day 3 started ABC won the time slot with "My Wife and Kids". It even beat ABC's entire prime time line up...this first episode of the night had 8.3/14 million viewers. The second episode followed up with 9.4/15 million viewers. Higher than the previous episode. So as you can see "My Wife and kids" is containing it's viewers and it's ratings. Check back here for next week's ratings the day after the new episode airs.